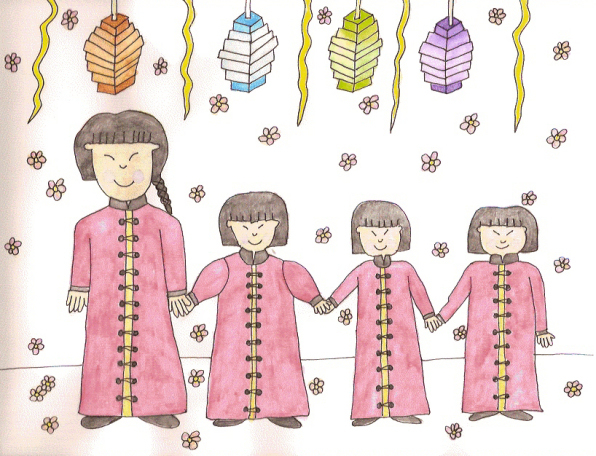 Sung-Li and her three daughters had looked forward to the Spring Festival for the last three months. Sung-Li took Ming Mei's hand. Ming-Mei took Ming-Li's hand and Ming Li took Ming-Su's hand. Together they walked to the park. Chinese lanterns hung from every tree. Green, orange, purple and blue ones danced in the wind, the candles inside flickering. The trees were full of pink blossoms that filled the air with a sweet, flowery scent. “I want to go and look for a cricket,” Ming-Su said. She let go of Ming-Li's hand and ran off. Sung-Li frowned. “You two stay right here, near these lanterns. I will go and look for Ming-Su. Mama left the two girls and went in search of her lost daughter. “I wonder where she is.” Sung-Li. “I wonder if she is painting a scroll.” Sung-Li looked for her near booth where children painted scrolls with black ink. She was not there. “I wonder if she went to find something to eat. Maybe I should buy the girls some jiaozi, a steamed dumpling, or the sweet glutinous rice pudding called nian gao. I should buy Ming-Mei a moon cake.” Sung-Li walked around for a long time. Finally she saw Ming-Su standing in front of the cricket cages. “I'm sorry, Mama. I was just so excited to have a cricket.” Ming-Su pouted. “I promise, Mama.” Ming-Su carried the tiny cage. A few minutes later they arrived back at the lanterns. “Mama, Ming-Su, you're back. We were worried.” Ming-Li hugged her sister. “Look what Mama bought me? It's a cricket. I will call him Chang.” Ming-Su held up the cage. “I want five of them, Mama.” Ming-Mei was so excited when Mama put five of them in her small hand. “Mama, I want to give one to Ming-Li and one to Ming-Su and I want you to have one. I'll have two for myself.” She passed them out to the others. “That was very kind, Ming-Mei. Now, we will go and fill up bags of cherry blossoms of Ming-Li.” Sung-Li led her girls to the trees. Thousands of pink blossoms fell when the breeze blew. The girls ran around gathering handfuls. They filled four bags with blossoms. None of them really wanted to leave. “Can't we stay and watch the fireworks tonight, Mama?” Ming-Mei pleaded. “Fireworks? Of course. Let's take our things home first and have some supper and then we'll come back and watch the fireworks. Maybe there will be a dragon.” Sung-Li smiled and took her girls home. “I had fun, Mama. I poured all my blossoms into a big bowl, so everyone can smell them any time they want.” Ming-Li kissed her mama's cheek. “I had fun too, Mama and so did Chang. His cage is by the window so he can look outside.” Ming-Su pointed to her new friend. “Good night, my sweet girls.” Sung-Li pulled the blankets up around them. “Good night, Mama.” Soon all of the girls lay quietly while thoughts of their fun time at the Spring Festival rocked them to sleep.